Children in East Africa face many barriers to learning the computer skills that will prepare them to thrive in the global economy. Today, the first Swahili-language software for children is being released, the result of a collaboration between the Kamusi Project and the Open Swahili Localization Project (OSLP) at the University of Dar es Salaam. 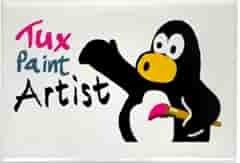 The software is a complete Swahili adaptation of Tux Paint, a popular free and open source drawing program for children. Tux Paint in Swahili (TuKsi Koti la Rangi) is being released in time for three major holidays Christmas, Kwanzaa, and the Moslem festival of Eid al Adha. Parents looking for last-minute gifts will be especially pleased with the price. Because Tux Paint is open source software, the Swahili package is distributed for free. It is available for download on several Internet sites. "This is a present for the Swahili community", said Alberto Escudero Pascual, the OSLP technical project coordinator. "We wanted to make something for kids. This program can be used in homes, schools, and cybercafes to introduce Swahili-speaking children to using a computer. And they can have a lot of fun while theyre learning". Martin Benjamin, who edits the Kamusi Project Internet Living Swahili Dictionary, agrees. "Until now, children in East Africa who had access to computers couldn't use them unless they knew English. With Tux Paint in Swahili, kids can just immerse themselves in the program. If they are too young to read, their parents don't need to know English in order to help them, so this program can also build computer skills for adults." The program will also be useful to students of Swahili. Swahili, the official language of the African Union, is the most widely spoken African language. It is taught at over one hundred universities in the United States, and in many other countries. Swahili was chosen as the language of Kwanzaa, the African-American celebration of family, community, and culture that begins on December 26. Parents and students who download the software onto their home computers will find that the program teaches many Swahili words and concepts. "As a student studying Swahili, Tux Paint is incredibly useful," said Ewurabena Hutchful, a student at Wesleyan University who tested the software. "It's easy to use and very instructive. I learned about numbers, colours, shapes, and computer terms such as 'to print' and 'to save'. Tux Paint in Swahili teaches essential, useful vocabulary in a fun and highly enjoyable way." Benjamin prepared the translations for the project, and Escudero-Pascual did the technical conversions. Benjamin previously did most of Google's Swahili localization. "The Tux Paint localization benefited from the work that OSLP has done this year to standardize computer terminology in Swahili", he said. "Now the door is open for Swahili versions of many more software programs". Tux Paint in Swahili is the second widely-available result of a formal technical collaboration between the Kamusi Project and OSLP. The two projects are working together to develop several innovative computer applications for Swahili, and to improve computer access for users in East Africa. OSLP recently released a Swahili spell-checker for Linux that was based in part on data from the Kamusi Project. OSLP (www.kilinux.org) is based at the University of Dar es Salaam's Department of Computer Science. Acknowledments: Swahili Tux Paint was possible thanks to the help of Bill Kendrick (Tux Paint main developer, New breed software), John Popplewell (Win32 Tux Paint build) and David Fraser (Pootle). Special thanks to Bill for e-mailing after the release of Jambo OpenOffice.org, all the energy to you and your family in these difficult days! What are they saying about TuKsi Koti la Rangi? This is really cool! -- Ewarabena Hutchful, a student in a Swahili class at Wesleyan University who tested the software.